Маркирани оферти за ARCTIC F12 Pro TC 120mm (AFACO-12PT0-GBA01) Как са подбрани? The intelligent programmed temperature controller and accurate temperature detection make ARCTIC F Pro TC the best TC fans in the market. Unlike other generic temperature controlled case fans, the ARCTIC F Pro TC fan provides cooling according to not only the temperature, but also the overall necessity for cooling. The revolutionary programmed temperature controller plays a key role. As shown in the chart, when case ambient air temperature is at safe level 0°C to 32°C, the ARCTIC F Pro TC fan speed remains at its lowest (500 rpm). This is to offer adequate ventilation at the lowest noise level possible. 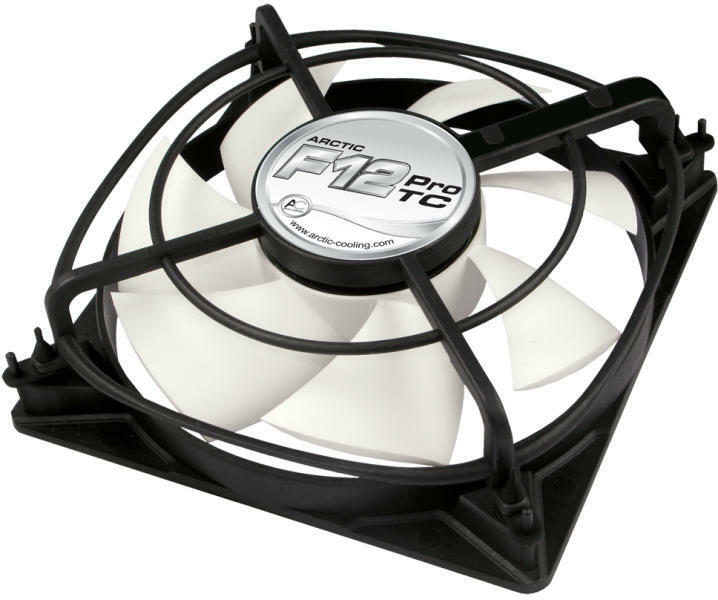 The ARCTIC F Pro TC is therefore completely inaudible (0.05 sone) at low temperatures – a much quieter level than generic TC fans. However, once a gaming system is at load, the case ambient air temperature will go up speedily, and without any case fans, most likely it will rise above 40°C, an overheated level for most PC cases. High performance and instant cooling is vital at this stage in order to eliminate the risk of overheating and system instability. The ARCTIC F Pro TC is programmed to achieve top fan speed at 38°C. The fan responses to the rise in temperature swiftly – within a critical 6°C range, the rpm of the ARCTIC F Pro TC fan increases from around 500 to its maximum of 2,000 rpm (the steep curve in the chart). Heat is dissipated from the case rapidly in order to achieve immediate cooling. As a result, the case air temperature remains at 38°C or below and thus the possibility of having a system failure can be eliminated. The accurate temperature sensor of the ARCTIC F Pro TC is equipped at the end of a 40cm cable. This gives much better flexibility when choosing the most appropriate spot that users would like to have the temperature detection.